Will, you have the option of pitching any of your pitchers first. Let me know if you are going with your 1, 2, 3, or 4. I'll stick with 1-4 unless we have roster changes tomorrow. I will post any changes. Whoa congrats Will. Good luck in the WS. Bissette, after your previous Series, you can start the World Series with either your #3 (Hanson) or #4 (Medlen). Post which one you are going with before Starting Game 1. When you get to your #5, you can either pitch him or go back immediatley to your #1. Again, post which way you are going. I figured that I could start my #1 starter...Did not read post first. I just figured cause in reality, that is what would happen, I thought...But I could have been wrong. Will and I played game 1 and game 2 and I kept everything the same. Braves Lead Series 2-0 heading to Atlanta!! Playoff rules put the onus on BOTH players to make sure the game setup is correct. If Will was ok with your playing with an out of place rotation, then I guess that new rotation is now official. Play your number 3 in Game 3. I am cool with the rotation, no problems. Highlight Reels to be posted this afternoon. Game 1: Both the Braves and Twins were tight heading into the first game of this fall classic. However, the Braves were the first to loosen up by 7 runs in the top of the 9th inning, six of which came with two outs on the board. The Twins bullpen was not at their best that is for sure. Game 2: This time the Twins came out scoring first but couldn't hold onto the lead. The hot Braves plated 4 runs in the 5th inning off of back to back to back to back doubles. Yep that's four doubles in a row. 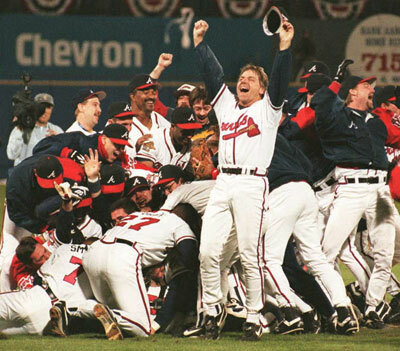 From then on the Braves never looked back as they then cruised to a 5-1 win in game 2. The Twins had plenty of scoring opportunities throughout, but when you leave 11 runners on base you should expect to walk away with the loss!!! 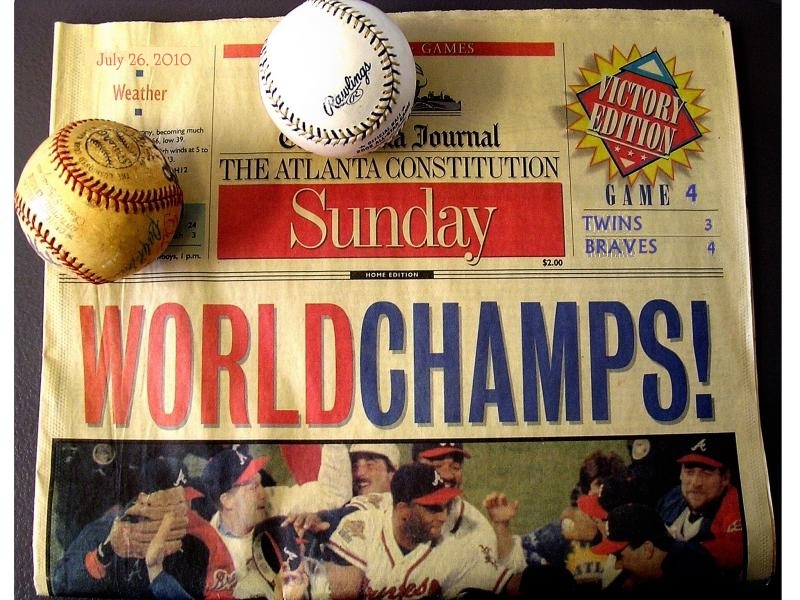 With Game 3 around the corner the Mighty Braves take 2-0 lead into a 3 game home stand in Atlanta. 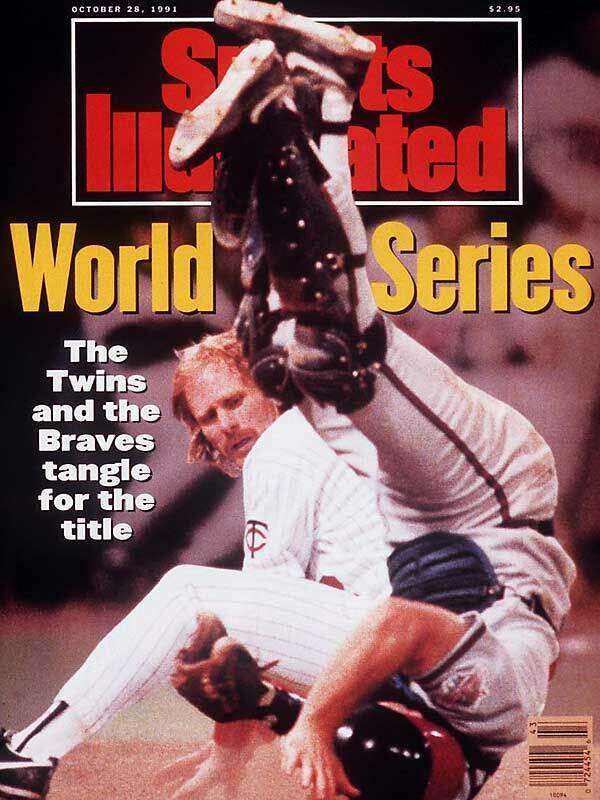 The Twins will have to salvage what pride they have left and take at least 2 of the 3 in Atlanta to bring the series back to Minnesota for a game 6 and possibly 7. What a game is all I have to say. Both the Braves and Twins were on the verge of kicking furniture over and throwing controllers across the room. The Twins got hot in the 4th scoring 8 runs and a plethora of extra base hits. This would frustrate the Braves, however, being the true player that BBissette19 is, he slowing crept his way back into the game until he took the lead in the bottom of the 8th on an infield chopper and bang bang play at first base!!! The Braves gained a crucial 3-0 lead by squeaking past the visiting Twins 11-10. BRAVES WIN!!!! BRAVES WIN!!! BRAVES!!! 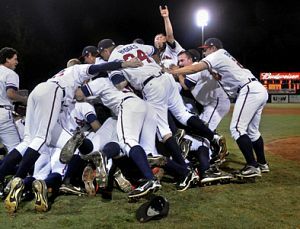 In a gutsy ball game the Braves steal a game and secure a sweep in the 4th season of the Phoenix League World Series!!!! 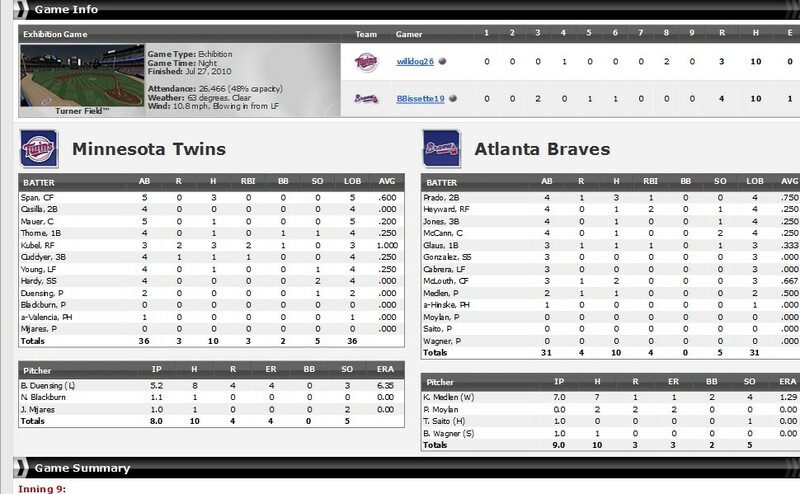 By a score of 4-3 the Atlanta Braves and BBissette19 sweep the Minnesota Twins and willdog26!!! 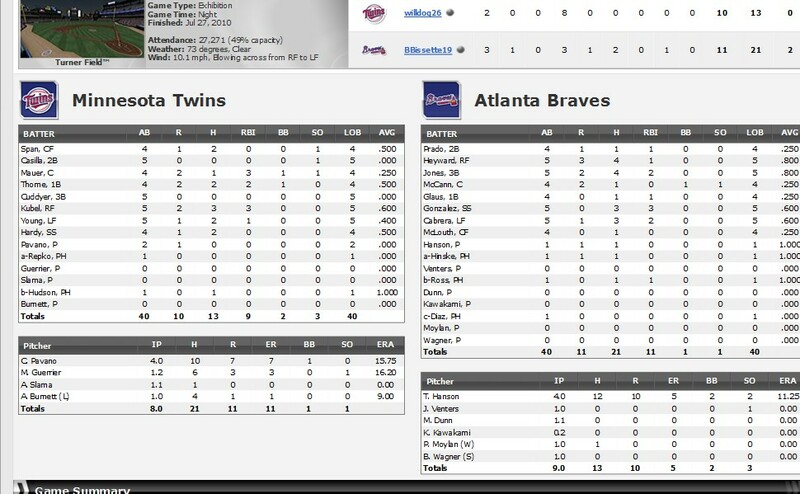 Same story as previous games, the Braves controlled the Twins every move with every pitch. Hats off to the Atlanta pitching staff to keeping the Twins bats quiet with runners in scoring position, all but Peter Moylan of course, who did give up back to back home runs to Kubel and Cuddyer in the 8th on 2 straight pitches. Other than that though he was superb in his 4 appearances in this Summer Classic. Congrats again to BBissette19, I think you really the most deserving of this championship in the league this year. You have struggled with connections, bootums, and a tough division to boot. You surprised all when you came from behind to knock off the 2 time raining champion WichiWichiPai in the Divisional Series. Then you stormed right past DaMilkmanPart2 in the Stengel Championship. While finally dominated willdog26 in the World Series!!! Then you stormed right past DaMilkmanPart2 in the Stengel Championship. While finally dominated willdog26 in the World Series!!! Thanks guys...I have loved every minute of the season. My personal life has interferred with my "game" life!!! I am a true gamer and love to have fun. If you guys' only knew what I have been going through but forget that!!! I have enjoyed this season through all the ups and downs!! Thank you Mike for being the commish you are and allowing us men to have fun!! Thank you. Thanks Will and Milton for your support!! Congratulations to will and bbissette on what appears to be a well played World Series. Bissette, you beat some great teams to get there, as well as some trials and tribulations through the season, so you have certainly earned it. Your name shall be placed in the Hall of Champions. Congratulations!!! Congrats Bbissette, well deserved, U were one of the top hitters in the league, had my number all season long. HAHA Leo...Thank you. When do we go again???? Season 5 HERE WE COME! !